Building an economical space station poses a novel challenge to the aerospace community, one it may be hard put to meet. A Marshall Space Flight Center document entitled “Technology Required for Space Station” suggests the reasons. It calls for advances in propulsion, materials, sensors, solar arrays, mass memories, momentum management systems, energy storage, computer architectures, high-voltage systems, millimeter-wave communications, and trash management. Cost estimates for a NASA space station total some eight or nine billion dollars. This seems a lot of money. Theorem: No new technology is required for a space station. Proof: We already built one. Qualification: Some new technology might be cost-effective, and a new design will obviously require some new hardware. Why, then, should a space station cost almost ten billion dollars? Because of the cost of launch? Hardly. At a projected late-1980s shuttle launch price of about $2,000 per kilogram, one billion dollars could orbit five hundred tons — about twice the mass of a hefty station, or five times the mass of Skylab. True, the shuttle is subsidized, but even allowing five hundred tons at $5,000 per kilogram, the costwould be $2.5 billion, far less than eight or nine. Is the problem the cost of purchasing the needed hardware? The most sophisticated spacecraft in existence, the shuttle, can serve as a space station for a week or more at a time, as one of its secondary functions. A space station’s worth of hardware seems comparable to perhaps one or two space-shuttle’s worth — but buying an additional space shuttle would cost “only” some $1.5 billion. The source of the bulk of the cost is suggested by the first paragraph above — NASA plans to design and develop a lot of new hardware, and expects it to cost about as much as space hardware has in the past. But should it? One might argue that someone outside the program (MlT will not build the station) is in no position to criticize the results of the labors of armies of experienced aerospace engineers — but is their experience fully relevant? Apparently not; space stations (and low-Earth orbit industrial hardware in general) fall outside the range of normal aerospace products. Aerospace companies chiefly develop and build aerospace vehicles, but a space station will differ from traditional aerospace vehicles in several fundamental ways. Imagine designing a jet aircraft. Every kilogram taken out of its mass in the design stage means that an additional kilogram of cargo (or of sensors and weapons) can he carried on every flight for years, and by an entire fleet of similar vehicles. Similarly, taking mass out of launch vehicle designs brings enormous payoffs, allowing each flight of the design to carry additional mass to orbit, earning high revenues. Low mass design entails several costs, however. First, more effort must be expended to come up with clever concepts. Second, analysis must be accurate, since small errors can make a big difference in a system stressed near its limits. Third, for similar reasons, manufacture must he precise. Finally, and likewise, testing must be careful and rigorous. These costs now dominate the cost of aerospace projects; materials cost little, and fabrication per se costs less than documentation and quality control. Now imagine that you plan to build a cabin on a mountaintop overlooking Denver, two miles above sea level. You choose to deliver it in prefabricated pieces by helicopter, since no road leads there. Consider the follow ing “reasoning”: Two miles high — that’s way up in the air. Getting there by helicopter — that makes it an aerospace project, like an aircraft. Therefore, an aerospace company must do the job, and designing and building it will cost as much as developing and certifying a new business jet of comparable size: many, many tens of millions of dollars. Yet NASA seems bent on developing a space station in a similar fashion, treating it as a sophisticated space vehicle. Is a space station an aerospace vehicle? Yes, in some ways, yet it differs from almost all other vehicles in that added mass in no way degrades its performance. Adding a kilogram to its mass would add a few thousand dollars to the launch cost — once. We will not he building a large fleet of identical stations and flinging them back and forth across the sky burning fuel proportional to their masses. Indeed, the amount of fuel needed to keep such a “vehicle” “flying” depends almost solely on its atmospheric drag, which in turn depends not on its mass, but on its frontal area. Greater mass would actually slow orbital decay, if the propulsion system were somehow to fail for months on end. In some respects, a space station thus resembles a building more than it does an aircraft or even a car. Ordinarily, so long as the cost of materials is not at issue, paring mass out of a machine design makes it cost more (in design, analysis, fabrication, testing, etc.). Unfortunately, common aerospace cost-estimating methods do not reflect this. Designers typically make rough estimates of the cost of developing a system based on its mass, assuming that each kilogram of equipment developed will cost a certain number of dollars (typically tens of thousands). This makes sense so long as the style of design is held constant: twice the mass then tends to mean twice the complexity. Yet a relaxed design style — based on redundancy and over-design should yield less expensive systems, for a given level of complexity. Here, however, the simple cost-proportional-to-mass rule gives the wrong answer: it suggests that, if you start out planning to build a heavy, rugged design. the harder you work to shave away every possible gram of mass, the less it will cost to design and develop. This rule thus tends to point designers in the wrong direction. The aerospace design tradition can lead to irrational results. At a NASA workshop on advanced space planning held at Woods Hole some years ago, Willis Hawkins of Lockheed told of his experience in getting designs and cost quotations for a gearbox. He gave the same specifications to a marine equipment company and to an aerospace company: both designed machinery to do the job. The aerospace-company design, however, was several times lighter — and cost many times more. Habit and tradition can he powerful forces. If NASA is using standard aerospace design techniques and cost-estimating relationships in its space station work (and everything I have run across suggests that they are), then we are getting plans for a supersonic jet when we need a cabin. This seems no way to open a frontier. Aside from the issue of mass-minimization, a space station differs from ordinary aerospace vehicles in other fundamental ways. What happens if a jet’s engines or controls fail? It may manage an emergency landing, but very likely it falls out of the sky, killing people and destroying millions of dollars worth of hardware. What happens if a space station’s thrusters fail? Very little. In general, comparatively few parts of a space station need be critical to safety. Placing potentially explosive parts outside, making the pressure vessel sturdy, and providing ample redundancy in the life-support system (plenty of bottled air and water, and stacks of freeze-dried chicken sandwiches?) seem the main requirements. Again, a space station resembles a cabin. If the propane bottle out back doesn’t blow up, and the roof doesn’t fall in and kill you, and you can radio for help, much can go wrong without threatening your life. This point gains support when one considers repairs. Aerospace designers, unlike cabin architects, must usually assume that occupants cannot repair malfunctions. Air crews cannot climb out on the wing of a jet to fix a flap actuator, nor replace an engine — they have neither the time, the parts, nor the physical ability to reach the site of the damage. On a space station, however, most problems could be repaired at leisure. Spare parts could be stored without penalizing performance, or could be launched. With proper design, all critical parts could have both ample room around them for access and simple enough interfaces to let a crew member remove and replace them with reasonable tools and in a reasonable amount of time. Reliability requirements could thus be relaxed to something more nearly approximating industrial standards — a desirable change, if we are to have practical space industry. Skylab showed how much can go wrong and still be repairable or tolerable. 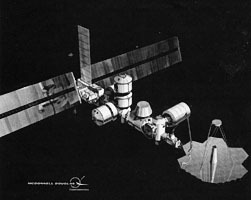 Launch stresses ripped off a major solar array, and a thermal control shield as well, yet with on-orbit repairs, Skylab completed its mission. With equipment designed to large safety margins — comparatively heavy, but who cares? — and given a sheltered ride to the benign environment of Earth orbit, such drastic damage should he unlikely. In short, program managers have great incentives to reduce their risk by spending other people’s money. This inflates costs: where calculated boldness would often pay off this incentive system forces program managers to buy too much safety and too little results. This is caused not simply by individual decisions to reduce risks, regardless of cost; rather, this pattern is ingrained into the structure of government-funded development organizations, into the way they operate. There need be no money-wasting devils to result in a devilish waste of money. Such observations regarding risk-averseness are not novel. The October 1983 Astronautics and Aeronautics (a publication of the AIAA) quotes Michael Sander, director of the Space-lab Missions Division at NASA headquarters. Regarding efforts at cost reduction, he asked “Is NASA willing to take on a program with less than 100% confidence of success?…Will Administrator James Beggs stand up and say, ‘I will shoot no messengers if there’s a problem’?…We’re really talking about a cultural change.” These remarks described not NASA’s fear of a failure in its own hardware, but its fear of a failure in experiments supplied by outside researchers. Though no lives would be at risk, NASA fears that the public might perceive any problem as a “NASA failure” in the symbolic arena of space. Perhaps it is time to begin treating space less as a display case for technological perfection, and more as a frontier. Unfortunately, yet other forces push in the wrong direction. Contractors share a natural bias toward new hardware (making work for them), their hardware (ditto), and impressive, pretty hardware (for obvious reasons). Piecing together a heavy, inelegant system from someone else’s old hardware is naturally less popular. Further, a vicious cycle adds to the problems: Chances to develop new space systems are rare. To make the most of an opportunity, it makes sense to pile lots of new technology into the project — this both makes the job bigger, and advances the state of the art. This, however, makes new systems frightfully expensive. This, in turn, makes them even more rare. For all these many reasons, it would be surprising if NASA had aerospace companies designing practical, no-nonsense, minimum-cost space stations. It makes sense for someone to suggest different approaches, precisely because ordinary aerospace experience seems to carry misleading lessons. What is a staffed space station? In part, it is a life-support system with shirt-sleeve working spaces. These, in turn, consist of a set of pressure-cans linked by tunnels, having airlocks and plugged into an external system able to provide power, cooling, orientation, communications, and so forth. Inside the cans sit various air-cleaning and renewing boxes, food-boxes, and so forth. We have built such life-support cans in the past, and (since shuttles are flying and we can build more) we presumably can now build boxes able to keep people clean, fed, breathing, and the rest, with little redesign. Indeed, why redesign? To make them fit available spaces, perhaps — but why bother, when more cans could provide ample room, and when mass is cheap compared to design costs? To make them last longer, perhaps — but spares and repairs (and minor redesign) could surely overcome most such problems. To make them more efficient, perhaps — but how much better would they have to be to save enough mass in orbit to cover the cost of major redesign? Besides, if the life-support system produces considerable waste, one could always place it outside in pressure canisters as radiation shielding, then recycle it later, when enough has accumulated to justify designing the equipment to do so. The station as a whole would exist chiefly to provide various utilities and facilities, one of which is the crew itself. The basic requirements include power supply, communications, a heat sink, and a supporting structure with attitude control hardware. What needs tobe designed afresh to do this? We have solar panels, rechargable batteries, communications equipment, and radiators, all either on the shuttle or on satellites now in use or under development. Further, shuttle systems are already compatible in terms of voltages, temperatures, cooling fluids, and other characteristics of the basic station utilities. They can all withstand shuttle launch. Their boxes would he arranged and connected differently, but this seems a problem more for a wiring, plumbing. and ductwork contractor than for a space-vehicle engineer. This may seem to make light of the stringent requirements for systems integration in space vehicles, required if systems are to survive launch without significant chance of damage. Much effort is expended on “payload integration,” which means, above all, ensuring that the boxes are firmly mounted, and that all the plugs will stay plugged. Indeed, in Fairchild’s planned Leasecraft system, as described by Morton Cohen in Signal, “the payload and the spacecraft are never carried in the shuttle in a coupled mode, (hence) the design requirement for shuttle launch and landing loads is alleviated, simplifying the interface design and greatly reducing integration and test requirements and cost.” In short, Fairchild found that it would he cheaper to plug the system together in orbit than to integrate the payload on the ground. The same likely holds true for space station components, both inside cans and between major structural elements. Designing the station and its furnishings as a set of bolt-together boxes would ease both design and testing on the ground, and repair and replacement in orbit. T his leads to a concept in which the core of the space station is simply a structure carrying various utilities through standardized ducts to standardized plugs providing power, communications, support, and cooling. A plug might supply, for example, the same utilities that a shuttle supplies to pressurized Spacelab modules, or to a Spacelab pallet. 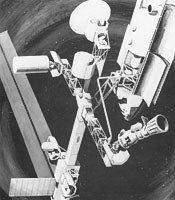 The considerable investment in Spacelab hardware and pallet-compatible instruments could then carry over directly to the station. (Purchase of Spacelab hardware for this purpose would also please Western Europeans — they designed and built Spacelab — while helping to balance U.S. trade in aerospace systems within the Western Alliance.) The station core system should have room to plug in more radiators, more solar cell arrays, and more structure and utilities ducts. Attitude control thrusters should be programmable and oversized, to allow for changes in configuration. In deciding how to provide power, heat, cooling, air, and the rest, it seems that the question should be not “how many new technology ‘requirements’ can we dream up?” but rather, “why can’t we use this piece of hardware developed for the shuttle (or for Spacelab, Leasecraft, or Sears)?” The result should probably be heavy and gross, something not pushing the limits of technology, something that everyone in the project will be ashamed of — except that it works, saving money and helping to open the space frontier faster, sooner, and cheaper. Can this be done? Politically, perhaps not. People playing the aerospace development game all have real pressures on them to keep playing it the same general way. Yet, some hardware has been built and flown that breaks the mold. Consider the recently flown SPAS (shuttle pallet satellite) vehicle, built by MBB (Messerschmidt-Broelkow-Blohm). Though it is designed for reuse — giving a real incentive for mass-minimization — MBB developed and produced it for only $10 million, about one-sixth the cost of a comparable satellite designed and built in more traditional ways. Indeed, it cost about as much to make as to fly, rather than vastly more. The secret? MBB used off-the-shelf components extensively. The main structure consisted of carbon-fiber tubing wound by a company that makes almost identical tubing for windsurfer masts. Rather than using specially designed lights costing tens of thousands of dollars, MBB used $10 helicopter lights. Likewise, to store compressed gas, they used modified scuba-diving tanks. These adapted parts all worked without a hitch. Why can’t a similar approach be used in a space station? A station poses no important new technological challenges, certainly none comparable to those of the shuttle, with its high-performance reusable rocket engines and novel insulated airframe. Most required subsystems have been built and used in the past. Most interfaces need be designed to survive only the mild environment of space. The station will have people aboard, presumably having tools and the competence to use them. Subsystems can be designed to be replaceable. System mass matters comparatively little. Why can’t we have a cheaper space station? Why can’t we treat space as a frontier, as a place to try things and make them work? The real challenge lies in politics and project management. To succeed will require a change in perception: rather than seeing a space station as embodying high technology, as pushing back frontiers in its very construction, we need to see it as a place for developing and using high technology. NASA is chartered to do research, but it does not build its laboratory buildings out of titanium and carbon-fiber composite. It needs to focus less on the technology of the space station itself, and more on opening space to practical use. The challenge of the space station is to recognize how little challenge it need be, and to act accordingly. This challenge is great, but meeting it could lead to a breakthrough in space engineering — one crucial to opening space as a true frontier. L-5 News Associate Editor Eric Drexler has just completed both a term on the L-5 Society Board of Directors and a book on technology, society, and the future.